Alison Kennedy is the Director of the Hartree Centre, based at the UK’s Science and Facilities Council’s National Laboratory at Daresbury in the UK. The Hartree Centre is funded by the UK government with a remit to improve the global competitiveness of UK industry by facilitating the adoption of High Performance Computing (HPC), High Performance Data Analytics and Cognitive Computing techniques by companies of all sizes. 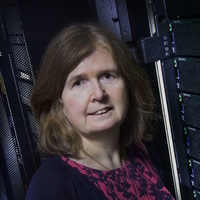 Prior to joining the Hartree Centre, she was the Executive Director of EPCC, the national HPC centre based at the University of Edinburgh and in 2016, she completed a term of office as the Managing Director and Chair of the Board of Directors of PRACE (Partnership for Advanced Computing in Europe), an association of 24 countries working together for the benefit of Europe. She began her working life as a real time systems programmer in industry, writing operating systems, prior to moving to a role as a software product manager. She has now worked in HPC for more than 25 years, initially managing large collaborative projects in HPC and Data, and latterly a HPC centre director. She is also one of the founders of the Women in HPC network, committed to improving inclusivity and diversity in HPC and related fields. Alison has a MA degree in History from the University of Edinburgh, a BSc degree in Technology and Mathematics from the Open University and a post-graduate degree in Business Administration from Heriot-Watt University.